Brummett, Palmira. 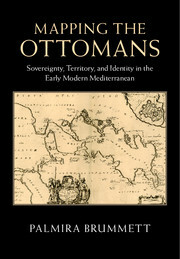 Mapping the Ottomans: Sovereignty, Territory, and Identity in the Early Modern Mediterranean. Cambridge: Cambridge University Press, 2015. The thrust of Kaplan’s dissertation was recently published as a separate article titled ‘“Writing Down the Country”: Travelers and the Emergence of the Archaeological Gaze.,” in Stroulia and Sutton’s Archaeology in Situ: Sites, Archaeology and Communities in Greece (Plymouth: Lexington Books, 2010). That article, in my view, is a must read for students who converge every summer on ancient Corinth or archaeological work.